Ali Al-Assaf is the Country Director for CIVIC’s Iraq Program. In more than 20 years of experience with international not-for-profit agencies and corporate engineering, he has worked for IWPR (Institute for War and Peace Reporting), Oxfam, Mercy Corps, Relief International, UN agencies, and USAID-funded programs on conflict mitigation, peacebuilding, civil society engagement, strengthening local governments, and humanitarian aid. With extensive experience in project development and management, training, and M&E, Ali has conducted studies and research on civil society, youth, humanitarian aid, and conflict management. 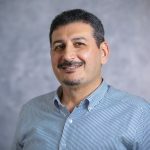 Ali has a Ph.D. in Engineering Management and Project Design and holds PMD-executive level from Maastricht School of Management MSM, and PMD Pro for Program management-APMG international.